Anthony Palliser is my dear friend. Diane Lawyer Palliser, his beloved wife, is my dear friend. They have both come to be dear friends of my husband Andy as well. Anthony and I taught together at the School of Visual Arts in Savannah — Anthony from Paris and I from across the bridge in Carolina. Anthony, whose work hangs in collections around the globe, taught painting, while I taught humanities — literature, religion, history — you name it, to an elite corps of fabulously talented art students. Oh, the discourse we savored over lingering lunches punctuated by martinis and espresso. When time came to consider cover art for Untying the Moon, I perused thousands of images — of rivers and dolphins and moons — of Lowcountry landscapes and waterscapes and skies. 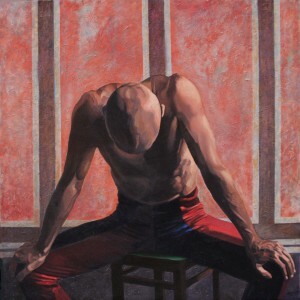 Then one day it occurred to me to open a book of Anthony Palliser’s paintings — paintings I know and revere — this time with an eye toward Bailey Martin, the protagonist of the novel. And there she was . . . with that longing, languorous gaze over the river toward that enigmatic light across the way. Perfect. I was moonstruck. 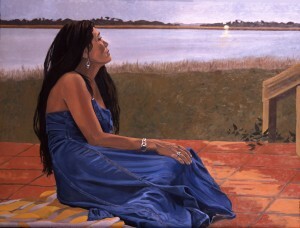 When Anthony generously agreed for the painting, The Blue Dress, to be used for the cover art, I was delighted. That the model for the painting is Diane makes the pleasure even greater. Anthony Palliser was born in 1949 of an English father and a Belgian mother. He studied at Downside school and graduated from New College Oxford. In 1967 he attended the Academy of Fine Arts in Rome. In 1970 he settled in Paris where he still lives and works. From 1995 to 1997 he taught as visiting professor at the New York School of Visual Arts in Savannah, Georgia. He remains a frequent visitor to Savannah and Charleston, S.C. where the unique landscapes of the low-country remain a constant source of inspiration. To date he has had 28 one-man exhibitions and countless group shows all over Europe and the USA. His acclaimed 1996 show “Performers” at Lincoln Center in New York showed his enthusiasm for the theatre and cinema. His well-known portrait of Graham Greene hangs in the National Portrait Gallery in London and that of Paddy Ashdown in the House of Commons. He has also recently completed portraits of Kenzo, the poets Seamus Heaney and Derek Mahon, directors James Ivory and John Boorman, and is presently working on portraits of John Banville and Marianne Faithful. Click here to see more of Anthony’s work.